I was on the Operating Table. Dr. Prem Chand Gupta and his assistant surgeon were operating on my left upper arm. They were creating an arteriovenous fistula - basically connecting a vein and an artery to enable my vein to carry blood at high pressures that would make it suitable for hemodialysis. The surgery was to take only about 45 minutes to an hour. We were about an hour and a half into the surgery. I could sense that everything was not all right. Dr. Gupta and his assistant were talking about some problem in the vein. After a while, Dr. Gupta said, "Mr. Shah, there seems to be a block in the vein and we will have to do something else. So, please bear with us for some more time!" The team then basically grafted a part of another vein and created the fistula at the end of three hours. When I went back to my nephrologist and showed him the surgery notes, he remarked that if it was any other surgeon, he would have given up at the first instance. I thanked my stars that I had Dr. P. C. Gupta operating on me! Unfortunately, many doctors today don't treat this with the importance it deserves. There are some simple things that can be done to ensure that we preserve sites for fistulas well. For example, before selecting a site, check all available options and if necessary, do a scan to check the size of the veins. Many fistula surgeries have failed because of insufficient size of the veins. Once a fistula is made and a problem is discovered, all attempts must be made to rectify the problem rather than hurry into a new fistula! I have heard of many patients being subjected to a new fistula at the slightest hint of a problem with the existing fistula! This is ridiculous. The site is precious. Only after all attempts at restoring the current fistula have failed should a new fistula be attempted. 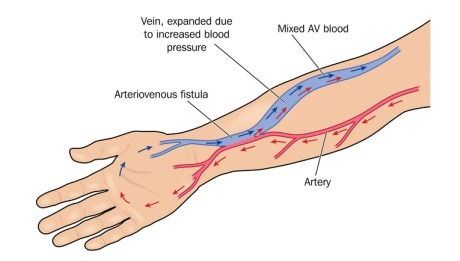 The trouble with our country is the lack of good vascular surgeons. We have very few as skilled and committed as Dr. Gupta. This makes the few that are available very busy. This means that some kind if intervention to save a fistula would be delayed by weeks if you want to get it done by an expert. Letting someone with less experience take a shot may not be effective! Yes, yet another problem Indian dialyzors have to deal with! But at least, if we are aware of the problem, we can think of ways we can overcome it. Many patients are not even aware of the importance of the limited number of fistula sites. Three of my four possible sites are already used up. I must make sure I preserve the current site as well as possible. I need many, many years of service from my fistula! Yes you were right Kamal, Dr.P.C.Gupta is one such talented and a nice human being. I have heard that he don't even charge for fistula surgeries from the poor. He did a fistula to my mother 2 weeks back when couple of surgeons from Apollo Jubilee Hills said it can't be done. Kamal...I feel... Every nephrology department must have a vascular surgeon like Dr Gupta... To deal with fistula... Because every dializer will wish for many many years of service.. Indeed..